"[William Dunbar is] in many ways the greatest, as he is the most varied, of Scottish poets." Although the "Scottish Chaucer" left to posterity vivid images of Scotland during the reign of James IV, much of his life, including the dates of his birth and death, remains obscure. We know for certain he was a Lowlander from the Lothian region, and that he spent much time in Edinburgh. His name first appears in public records in 1477 in the Register of the Faculty of Arts at the University of St. Andrews; in 1479 he was counted among the masters of the university. Nothing definite can be said of his activities between 1480 and 1500, although some of his poems imply familiarity with Denmark and France; some sources suggest he spent the two decades as a wandering Franciscan friar in France. Dunbar returned to Scotland at the turn of the century, and his life is best documented between 1500 and 1513 through his poems and entries in the royal registers for pension payments and livery grants. His literary life began as a Rhymer for the Royal Court of James IV, for which he received an annual salary; he was also ordained as a priest by 1504, referred to in later records as a chaplain. Several of his poems voiced his hopes for a benefice; however, well-educated clergymen of the time were more often than not employed in government, and Dunbar served some role in the Royal Secretariat as a clerk or envoy, and occasionally acted as an advocate in courts of law. 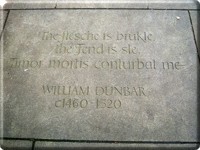 Dunbar's made his last appearance in the court records in May 1513. The royal household provided Dunbar not only with his livelihood, but with his primary audience and the setting for his poetry. Many of his poems addressed the king and queen, or other members of the court, and celebrated festivities such as James IV's marriage to Margaret Tudor in 1503; the Tournament of the Black Lady in 1507; the arrival of French envoy Bernard Stewart in 1508; and the Queen's visit to Aberdeen in 1511 - though he was not afraid to offer James IV unsolicited advice, or mock his reputation as a philanderer. 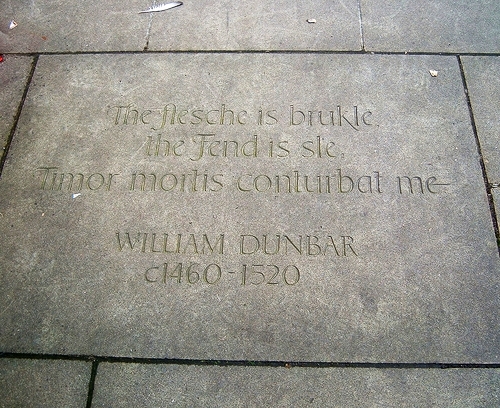 Dunbar distinguished himself from other late medieval poets with the brevity and compression of his verse, and was renowned for his virtuosity and versatility. The subject matter of his verses ranged from migraine headaches to pious, technical treatises on penance, experimenting with an exhaustive range of forms and genres, including elegies, love epistles, beast fables, sardonic political satire, and more. He was a master stylist, bold and self-confident in his sensitivity to diction and connotation, employing with equal deftness high Latinate style ("The Goldyn Targe,") and bawdy colloquial expression ("The Flyting"). However, his best work is perhaps evidenced in his employment of the invective humour that runs throughout his personal and social satires, a strain which would span nearly three centuries to be received in the work of Robert Burns. Despite the half millennium that separates us from Dunbar, we are still entertained, still moved, and still shocked by his work. No wonder, then, that when Hugh Macdiarmid sought a witty, unsentimental model for the literature of the new Scottish Renaissance, he cried, "Not Burns - Dunbar!" View the full online text of "The Flyting of Dunbar and Kennedie"